As part of an effort to bring more content to the blog and to promote discussion of community events and updates, Gwen Muranaka of the Rafu Shimpo is graciously sharing content from the Rafu Community Page, published March 27, 2010. Look forward to more Community Page stories right here on the LT Blog! Consultant Douglas Kim speaks on Tuesday with members of Nishi Hongwanji Buddhist Temple. 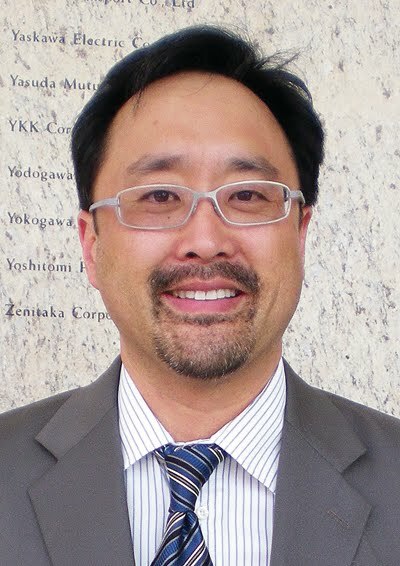 Douglas Kim, a transportation and environmental planner with 25 years experience, has been hired as a consultant who will provide technical expertise to the LTCC and help assess the impacts of the proposed Regional Connector on Little Tokyo and recommend a set of mitigation measures that can protect the physical, social, and economic environment in the community. transit planning expertise to public agencies and local communities. fact implemented in the future. "I have a history of working with community groups to ensure that their interests are protected from those agencies that build these systems," Kim said at the LTCC meeting on Tuesday. "I've seen a lot of systems get built without a lot of community input and there's only so much a transit agency can do if they don't have the perspective of the people who live and work in the community." Metro proposes a two-mile rail system that will connect its Gold, Blue, and Expo rail lines and allow passengers to travel throughout the region without transferring in downtown. It would include three stations in the downtown area between Little Tokyo and Bunker Hill. The system could cost about $1.25 billion and be running by 2019, though some estimates show operations by 2025. $160 million was already approved in November 2008 through a sales tax increase. In January 2009, Metro approved studying several alternatives, including a rail system at-grade and one partially underground. In response to community concerns about disruptions to Little Tokyo, Metro added another alternative in February 2010 that would run entirely underground through the area. The community wants to ensure that the Fully Underground Alternative is selected as the solution, since the At-Grade and Partially Underground Alternatives have unacceptable impacts to Little Tokyo, such as noise, traffic, and visual impacts, particularly at First and Alameda. However, the community insists that all environmental impacts from the Fully Underground Alternative be fully addressed. This includes concerns about how the 3-4 year construction period could disrupt local businesses, tourism, and everyday life. Major excavation and tunneling will occur in several locations to build stations, portals, and entrances. These "cut and cover" activities must minimize traffic, noise, air quality, and other impacts to nearby businesses and residents. Long-term concerns include noise and vibration from the underground system, the design of new development at the Office Depot location where an underground station would be located, and the system's impact on the cultural and economic identity of Little Tokyo. Kim will be holding meetings on April 22 at the Japanese American Cultural and Community Center at 4 p.m. for nonprofit organizations, churches and cultural groups; and 6 p.m. for residents to share their concerns regarding the Regional Connector. All are welcome to attend the meetings. A meeting for Little Tokyo businesses will be determined later. For more information, contact Kim at douglaskim@verizon.net or (310) 316-2800.